Gunmen have kidnapped two foreign aid workers in Darfur and are demanding a ransom for their release, Sudanese state media report. Aide Medicale Internationale confirmed that two of its workers, a Canadian and a French national, were abducted in southern Darfur on Saturday night. French officials say they are in contact with both the aid agency and the local authorities. Canada has said it is seeking information on the incident. It is the second kidnapping of Western humanitarian workers in Darfur in less than a month. 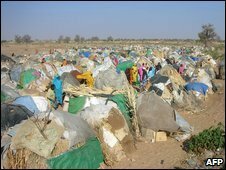 AMI has been operating in Darfur since 2004. Sudan expelled 13 international aid agencies after an international warrant was issued against President Omar al-Bashir last month for alleged war crimes in Darfur. America's special envoy to Sudan, Scott Gration, said at the weekend there was little prospect of the 13 organisations being allowed to return soon. Following a visit to a Darfur refugee camp on Sunday, Mr Gration said alternatives had to be found to get much-needed resources into the camps. AMI's two aid workers were abducted on Saturday night at gunpoint at Ed el-Fursan in southern Darfur, the agency said, condemning the action. Sudanese officials said that two Sudanese staff with the workers were also kidnapped but later released. Senior Sudanese foreign ministry official Ali Yussif said the government was "doing its best" to free the AMI staff. Frederic Mar, a spokesman for AMI, said the agency had been spared when Khartoum expelled the non-governmental organisations last month. "We were continuing our programme, we weren't targeted," he told AFP news agency. France's foreign ministry has set up a crisis response cell to deal with the kidnapping. In Ottawa, the Canadian foreign affairs department said it was ready to "provide consular aid". Three Medecins Sans Frontieres staff - a French administrator, a Canadian nurse and an Italian doctor - were freed on 12 March after being held for three days. Sudanese and Italian officials insisted that no ransom had been paid to secure their release.